Let me just tell you mamas, if nothing else this spa is beautiful. I used to frequent the building at 355 Fifth Avenue as my son’s barbershop was in the building. So, I frequently walked pass this space. What Mrs. Monica Smith was able to do with this space (that happens to be huge) is AMAZING! Visiting Euphorik Spalon you will not only get a customer-service focused experience, but you will feel like you are at some exclusive, Manhattan spa that only celebs have access to. So if you’re looking for some inspiration to start a new business, or just want to know how you can get book your appointment, check out this interview with Brown Mama Monica Smith! 1. What inspired you to start Euphorik? In my head I’d been planning this for the last 8 years. I was going to other hair salons and wasn’t always happy with the experience I had. Sometimes I felt like I was being rushed, or that my time wasn’t being respected. I would sit there for long periods of time or I wasn’t given the attention I felt I should get for patronizing that business. So, in the back of my mind I was plotting out doing it the right way. I never stopped thinking about it. For years I would research salons and I was also searching for space to rent. Over the last two years I really got fed-up. I got laid off from my job, started another business, which did ok but it wasn’t my passion. So I said I’m just going to start step-by-step and do this thing. Sometimes things have to happen to push you. And, here we are! 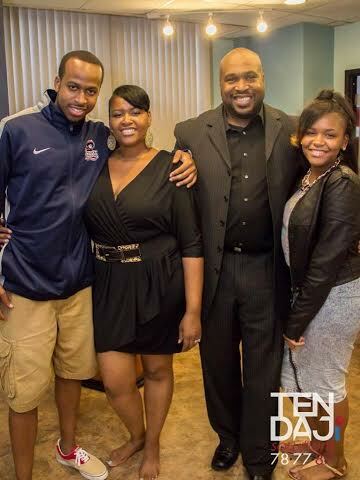 Monica Smith & her husband, Brian, with their two children Terrell, 22, and Dejah, 15. 2. How has being a mother prepared you for this experience? It was very different raising my daughter than raising my son. Having to teach her about her self-worth, proper grooming, appropriate attire, taking time for herself and things like that played a huge role. Not to mention time management, faith & sacrifice and wearing multiple hats. That played a part in me wanting to do the same thing for other women and girls. If you are a parent you can do any job out there. I swear I’m a master chef, a chauffeur, a therapist. I have done it all. 3. What makes Euphorik different from other Pittsburgh beauty salons? Excellent customer-service is our number one goal. I’ve told everyone that we’ve interviewed and hired that we are customer-service obsessed. That is our motto. Our tagline is “Experience the Difference” so we must have a difference to experience. I’ve invested in software and systems to connect with and service customers in and outside of the salon. We will valet park your car, we offer snacks and tea. Whatever makes our customers have a comfortable experience is important to us. And once a customer pays for their service, that is not the end. We have follow-up text messages and will invite our customers to rate our services and our stylist. We will have recommendation perks. We want to make sure our clients don’t just have an in and out experience. 4. This was a family affair as we discussed, how did your family contribute to the success of Euphorik? My husband, my brother, my kids we did everything step-by-step. I would take my brother, a licensed real estate agent, and my husband out looking for space constantly. My mom cooked dinner for us on many late nights and I would run so many ideas past her, my kids and the rest of my family. My family even helped pick out the name. A huge blessing was that my husband was able to hold down all the bills & notes at home while I began taking my paychecks and some of his to buy things piece-by-piece. So far we haven’t had to take out any loans. It was definitely a family thing. 5. Why is it important that moms take time to go to the spa? Moms to me are just givers by nature. It doesn’t even have to be your child. It’s just in our nature give, give, give. But in order to continue giving all the time, we have to pour back into ourselves. We need to rejuvenate, revitalize and just give back to yourself. If we’re no good, how can we really be good to others. 6. What services does Euphorik offer? 7. What does your business say about the climate for new Black business owners in Pittsburgh? I’m just a regular woman who had a desire and a dream. I didn’t rush it. I put a plan together. I didn’t have a deadline. I just moved at my own space and did things slowly, but surely. That just says that it’s still possible. You don’t have to move out of Pittsburgh to fulfill your dreams and desires. Find out more about Euphorik Spa and Salon by visiting their Facebook page, Twitter account or calling 412.281.4040 to book your appointment today!